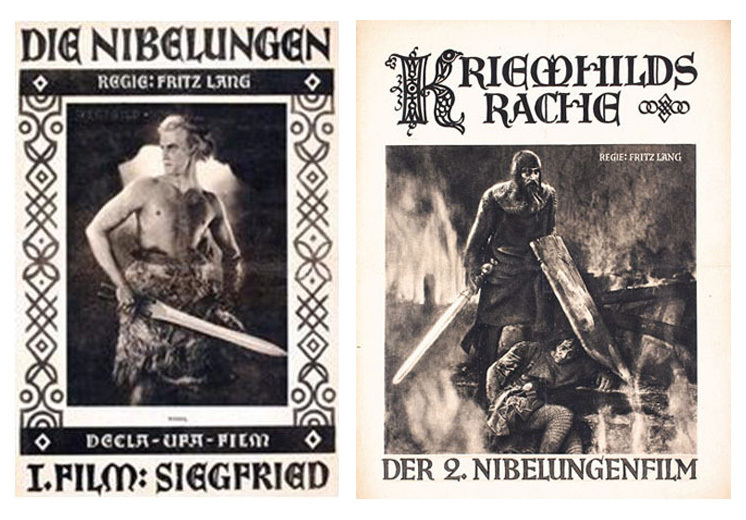 Between the operas of Der Ring des Nibelungen and the Lord of the Ring (both books and movies) stands the movie Der Nibelungen from 1924 by Fritz Lang. In narrative and presentation a kind of missing link between Wagner and Tolkien. A knight's tale with a touch of fantasy. Perhaps the first fantasy movie in his kind. It consists of two parts: Siegfried and Kriemhilds Rache (Kriemhilde’s Revenge). We see a dragon that is killed by the hero Siegfried who, by capturing the dwarf Alberich, comes in the possession of the Nibelungen hoard. Siegfried is murderded, as in Götterdämmerung, by Hagen. His bride Kriemhilde swears revenge. Justice is denied on her and Kriemhilde’s uncleansable thirst for vengeance makes the second movie in the Nibelungen a revenge-movie to remember. He isn’t really attractive – in fact he is really ugly – and with the slaying of Siegfried, the hero, he undoubtly qualifies for villain of the year. But this is not a movie about about heroes and villains. That is not the story Fritz Lang wants to tell. The story about Die Nibelungen is a story about loyalty. It is very hard to see loyality as a virtue when Hagen kills Siegfried. But he does so because he sees in the hero a threat for King Gunther. In the world of Die Nibelungen men are bound by oaths, not by individual ideas about “right and wrong”. It is that loyalty that prevents Kriemhilde from receiving the justice she demands. The people of Burgundy (including her brothers) are standing around Hagen. They don’t like what he has done but they cover his back. Kriemhilde leaves her family and marries Atilla the Hun. Of course, this is a marriage with no love lost on her part. The only thing she wants is to live the day she can have her revenge on Hagen. Her persistence to materialize that vengeance, even when the body count goes into double figures, takes away the sympathy the viewer might initially feels for her cause. The people around King Gunther never had that sympathy so we, the audience, are left with a movie in which no one deserves our sympathy anymore. It leaves us in a moral wasteland (not unreminiscent of Game of Thrones) that adds, because of its confusion and unpredictability, significantly to the movie experience of this viewer. It is sorely missed once the good and bad are spelled out. For great story telling you better be ambiguous than obvious. Like in Game of Thrones the band width from good to evil is stretched to such an extent that one has to check his masochistic tendencies when another character that seeks our empathy meets a horrible death (the slaying of the child of Atilla and Kriemhilde by Hagen gives Games of Thrones a run for its money), but in the end it leaves a landscape that is far more fascinating to watch than the children’s parade of, let’s say, The Hobbit. In 1924 ambiguity that adds to the excitement of story telling was not Fritz Lang’s main concern. He dedicated Die Nibelungen to the German people. In the aftermath of World War I Germany was running from one crisis into another; political and economical, suffering from hyper inflation and mass unemployment. It’s well possible that Lang, like Wagner before him, wanted to show the German people a mirror in which they could recognize themselves. A narrative based on German mythology that showed its viewers where they came from. A stronghold to identify with and an anchor in times of turmoil. With the history of the 20th century in retrospect it is easy to see the dark shadow of loyalty that forecasts the notorious “Befehl ist befehl” but it remains highly questionable if Lang was interested in presenting loyalty as a virtue. He considered it a typical German characteristic and for that matter we should perhaps think of this movie more as a mirror than as a pamphlet . A thing that reflects both beautiful and ugly parts. A few years later Fritz Lang would make Metropolis. A movie, like Die Nibelungen, that shows in substance and level of movie making that, despite all later technical developments, movie as an art-form has not changed significantly across the years and that its peak, reached back in the 1920s, is in many respects unsurpassed until this day.